Like a lot of products that I pick up, this too was because the shop was out of the usual fins I buy. I was looking for a new set of Vector II Future Fins for one of my boards and since there weren’t any left, I bought a different set of Future Fins called the FYU’s instead. When it says these surfboard fins have medium flex, you should know that they are still pretty stiff, probably a lot more so than most of us are used to. Most standard fins are made with plastic or a natural composite, which are a lot more flexible than the FYU’s, so if that is what you are used to then these guys are going to feel a lot more stiff. Of course they are built to be used in a specific type of surf, but can be fun in lots of conditions. Most my friends in Hawaii that have these use them on their Pipe boards because they are really good for big waves that are really fast and hollow. I have used these a few times in decent surf and can really feel a difference in the way my board reacts in the wave. 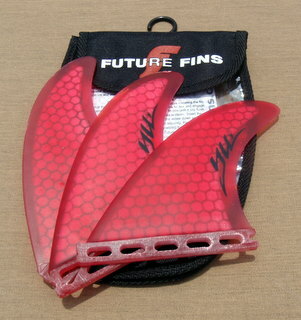 These Future Fins help you generate a lot of speed really quickly. They hold very well in big waves, helping you survive critical bottom turns without sliding out. 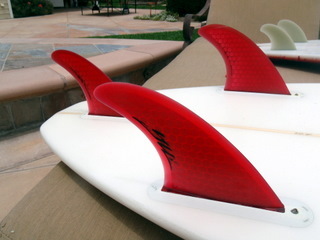 The fins cost around $64, but be assured that they definitely do what they were designed to do.